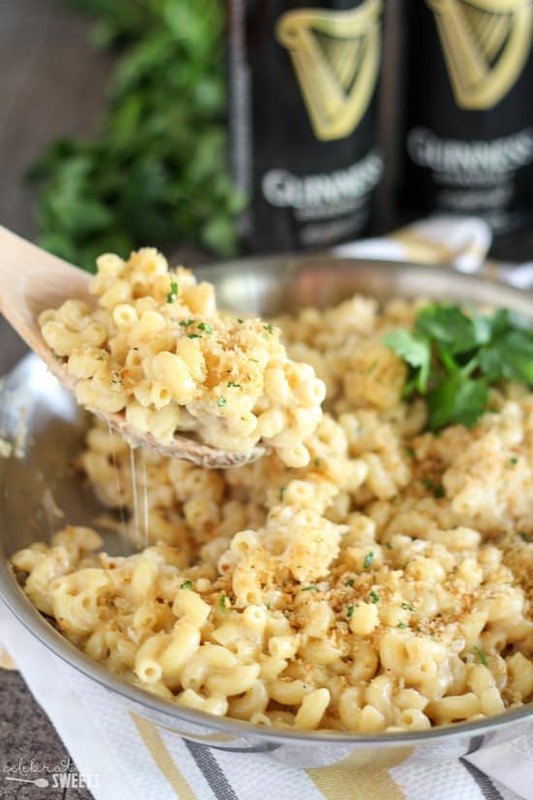 Guinness and Irish Cheddar Macaroni & Cheese – Flavorful stovetop mac and cheese made with Guinness stout, sharp Irish cheddar, and a touch of dijon mustard. Creamy and cheesy with an optional crunchy breadcrumb topping. St. Patrick’s Day is almost here! What will you be eating? Corned beef and cabbage? Shamrock shakes and green beer? 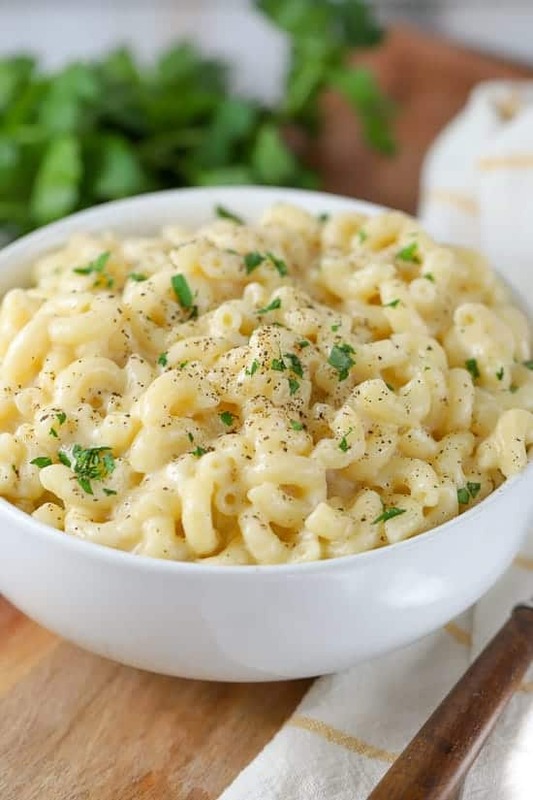 I’m not a huge fan of any of the above (although I could take down a loaf of Irish soda bread in record time), but what I am a fan of is macaroni and cheese! In honor of the upcoming holiday I made this delicious twist on mac and cheese by adding Guinness stout and lots of Irish cheddar cheese. And (eeeekkkk), it is SO, SO good!!! Like, can’t-put-down-my-fork-good. 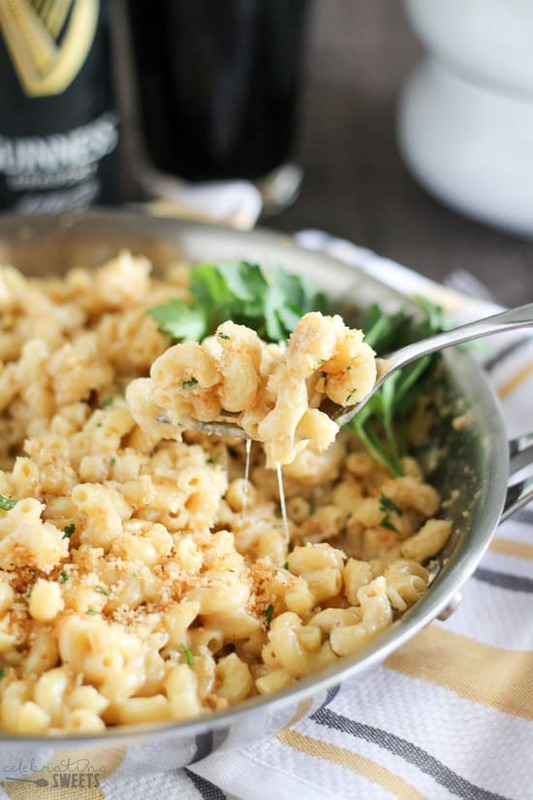 This recipe is super flavorful, ultra creamy, and my new favorite mac and cheese. Guinness, Irish cheddar, and a touch of dijon mustard add a slight sharpness that cuts through the richness of this dish. 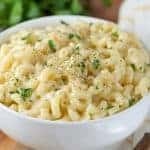 It’s a grown up version of mac and cheese that is boldly flavored and worlds apart from that bland stuff that comes in a box. I love the contrast of creamy and crunchy, so I topped this mac and cheese with a sprinkling of crunchy, garlicky breadcrumbs. Feel free to skip the topping if you’re looking to take a shortcut. It’s great either way! With or without the topping, there’s no need to turn on your oven. It’s all made on the stovetop. Pour a pint of Guinness, throw together a salad, and you have a perfect meal! Oh, and don’t forget dessert – Guinness Brownies with Irish Cream Frosting or Mint Chocolate Chip Cookies! Flavorful stovetop macaroni and cheese made with Guinness stout, sharp Irish cheddar, and a touch of dijon mustard. Creamy and cheesy with a crunchy garlic breadcrumb topping. A grown up version of a classic! In a medium skillet over medium-low heat, melt butter. Add garlic and breadcrumbs and cook, stirring frequently, until the breadcrumbs are lightly toasted and the mixture is fragrant. Remove from the heat, add salt and pepper to taste and minced parsley. Set aside. In a large saucepan over medium heat, melt butter and sprinkle in flour. Whisk together for a minute. While whisking, pour in Guinness, milk, half and half, salt, pepper, and mustard. Bring to a simmer and cook, whisking frequently, until it thickens slightly (several minutes). Add cream cheese and 2 1/2 cups grated cheddar and stir/whisk until completely smooth. Add drained, cooked pasta and stir to combine. Add remaining 1 cup grated cheddar and stir until melted (this will help achieve a stringy/cheesy-pull texture). I like to let this mixture sit over low heat for a few minutes, stirring frequently, so that the pasta can soak up some of the cheese. To serve: Transfer to a serving bowl or individual bowls and sprinkle the top with the reserved toasted breadcrumbs. Serve immediately. * This amount of butter and flour creates a fairly thin sauce. For a thicker sauce, you can increase the butter and flour to 3 or 4 tablespoons EACH. 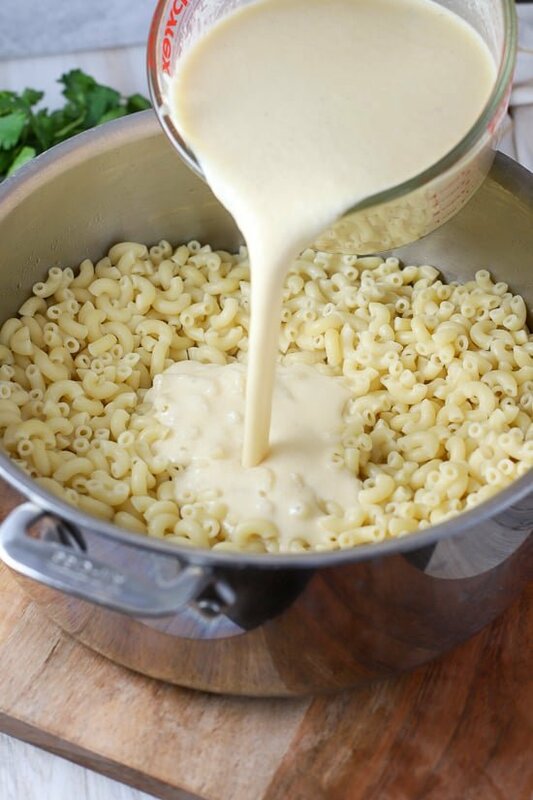 If the macaroni and cheese thickens up too much, add a little bit of the reserved pasta water (or additional milk) to make it creamy again. You can just add extra milk. If you want it richer you can swap the half and half with cream, but I don’t think it’s necessary. Enjoy! It’s half milk and half cream. Enjoy! Is it better to have room temp Guinness, versus cold Guinness? It will work either way. Enjoy! Can this be made in advance and kept warm until ready to serve? Just adding the topping when ready to serve it? I wouldn’t recommend making it more than an hour or two in advance. Make sure you keep it warm, and have some extra milk or half & half to stir in if it starts to thicken up. 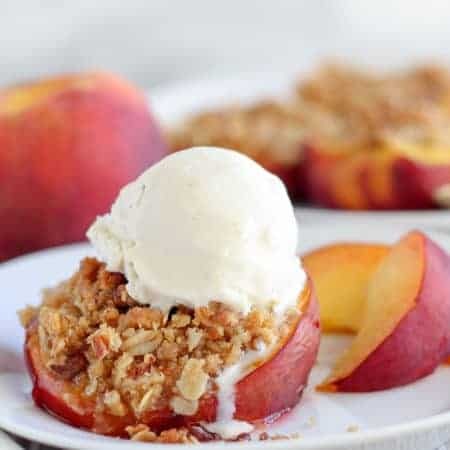 And yes, wait to add the topping until you’re ready to serve it. Enjoy! 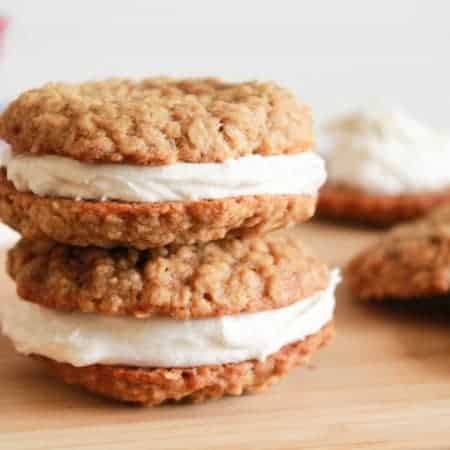 Wil this recipe work in a crock pot? You can’t cook it in a crock pot, but you can keep it warm in a crock pot. It’s probably best within a few hours. I would suggest having some extra milk or half & half to add to it if it thickens up. Also, either skip the breadcrumb topping, or serving it on the side. Enjoy! 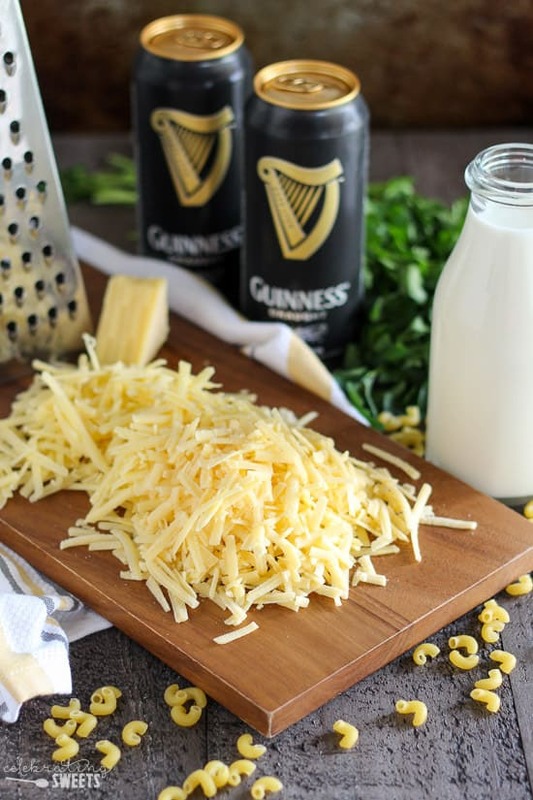 Will this recipe work with dubliner sharp irish cheddar instead of kerrygold? Hi, Riley. I have tried it with the Dubliner and I do not recommend it. Dubliner isn’t labeled as a “cheddar”, so it doesn’t melt as smoothly. 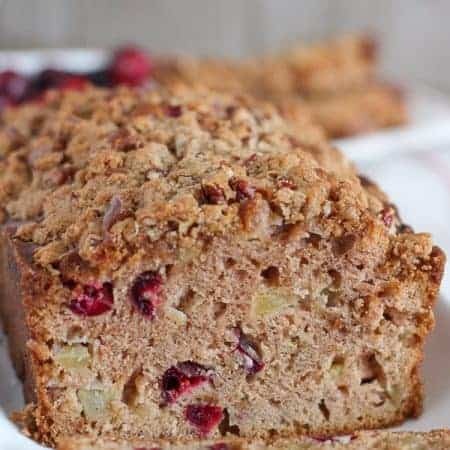 I noticed a slight graininess when using it in this recipe (still totally edible – but not super smooth and creamy). Dubliner is like a mix of parmesan and cheddar, and that extra dryness (from the parmesan like qualities) make it not melt as smoothly. I’d recommend sticking with a Kerrygold cheddar (labeled as such on the package), or any other cheddar. Enjoy!